SHOP for a CAUSE--NEW Thrift "Boutique"
Searching for a special occasion outfit to wear to a desert event? Check out our new thrift "Boutique" now open five days a week! Hundreds of high-quality, brand-name men’s and women’s clothing and accessories at unbelievable prices you will not find anywhere else. Everything is $5--buy four items and receive a fifth item FREE! We now accept credit and debit cards. SUMMER HOURS--The Boutique is now open Monday through Thursday-10:00am to 5:30pm. Call 760-776-9975 for more information. Your purchases directly support our mission to educate and empower our clients for employment success. Private parties are available. 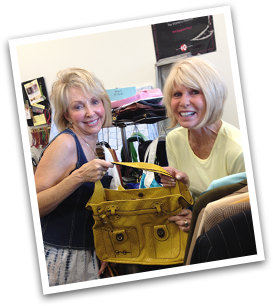 The best part is that every dollar spent helps provide services to Desert Best Friend’s Closet’s clients.